Numerous studies have highlighted the links between the cultivation of patience and good physical and mental health outcomes. According to 2007 and 2012 studies by Fuller Theological Seminary professor Sarah A. Schnitker, patient people are less likely to experience depression and other negative emotions. In her 2012 study, Schnitker invited 71 participants to undergo patience training, with people reporting less depression and higher levels of positive emotions at the end of the study period. Increased levels of patience throughout the training also led to enhanced mindfulness, greater gratitude, more connection to other people and the universe, and a greater sense of abundance. Interestingly, patient people were also likely to exert more effort toward their goals than people who did not identify as patient, with an increased sense of accomplishment often leading to a greater level of personal satisfaction. This sense of contentment can be catching, with a separate study by Debra R. Comer and Leslie E. Sekerka finding that patient people were more empathic, more agreeable, and more likely to display generosity and compassion to friends and neighbours. 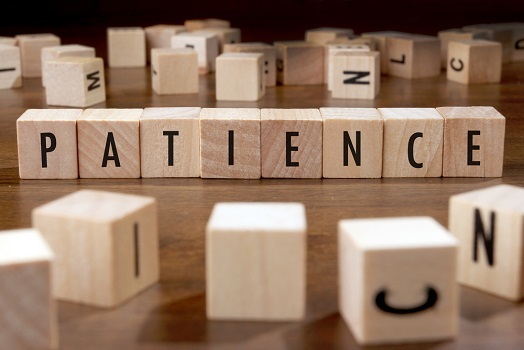 Patience can also be good for your physical health, with the mind and body intricately connected in ways we are only beginning to understand. The 2007 study by Schnitker and Emmons found that patient people were less likely to report common physical health problems such as headaches, acne, ulcers, diarrhoea, and pneumonia. Many of these conditions are linked with psychological stress and poor sleeping patterns, with a patient disposition possibly protecting us from the damaging effects of mental stress and physical inflammation. In a fascinating new study just published in Nature Communications, serotonin may be at the root of patience. While the neurotransmitter serotonin has always been a key focus in the treatment of mental conditions such as depression, it's method of action has been unclear. This study showed that serotonin actually increases patience, with mice more likely to wait for food when they were given serotonin stimulation. While mindfulness and meditation practices are often recommended to help people increase patience in the busy modern world, paying attention to your serotonin levels through diet and exercise modifications may also be beneficial.